Struggling to Keep Your Head Above Water? Wondering How You Will Ever Survive as a University Student? Interested in Learning a Proven Process for Boosting Your Executive Function Skills? ...So That You Can Improve Your Time Management Skills, Learn To Plan For & Actually Meet Deadlines, And Become More Organized...So That You Can Better Manage Your School, Work, and Personal Life...Oh! And Also Improve Your Grades! Are you prone to being overwhelmed with deadlines and school work? Are you constantly late and stressed? Are you missing assignments and other important papers? Do you put off projects and large assignments until the last minute? Are you exhausted from stress and worry? The Seeing My Time Group training program is specially designed to support university students with executive functioning difficulties (such as time-management, planning, and organization) to better manage their school, work, and personal lives. And, it also helps to improve your grades! Time: 2:00 p.m. - 3:30 p.m.
Includes 7 group sessions with other students who want to improve their executive function skills. 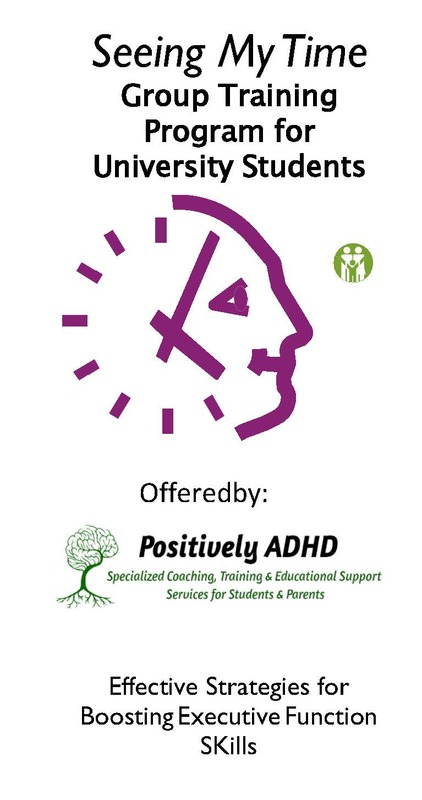 Lead by professional ADHD & Executive Function Coach and Trainer, Tammy James, who guides you through the Seeing My Time program and workbook. Sessions are 90 minutes long and held via teleconferencing software (Zoom). Workbooks and class materials included. 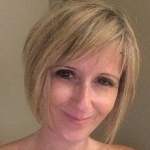 Provided as an alternative to private sessions with Tammy James, this group training program is offered at a significantly reduced rate (cost is less than half the price of private coaching sessions with Tammy James). Who Should Attend this Program? First year students who want to set themselves up for success as a university student. Upper year students struggling with time management, organization, and planning. Students who feel overwhelmed by the demands of life as a post-secondary student. ALL students on academic probation. Students who want to lessen their academic stress. Students with ADHD and/or Executive Function Challenges; also appropriate for students experiencing mental health challenges related to academic success. 1. Register for this course by clicking on the "Register for the Seeming My Time Group Course" link below. 2. After registering and submitting payment, you will receive an email with further information about the course, including an intake form to be completed before the course begins. 3. Workbooks and course materials are included in the registration fee, so no additional purchase will be necessary.